1-3/16" Sterling Silver St. Michael Medal Made in the USA. The Badge Shaped Medal is adorned with a Depiction of St. Michael Slaying Lucifer. 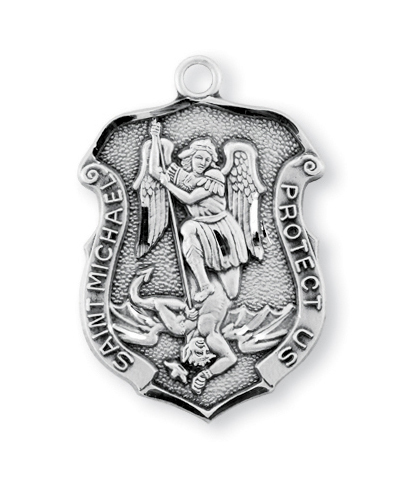 This Sterling Silver Badge Shaped St. Michael Medal is made in the USA. 5/8 x 3/8-inch Sterling Silver St. Michael the Archangel Medal. Comes as a ready-to-wear package with an 18-inch Sterling Silver chain with a lobster claw clasp and a premium keepsake jewelry box. 3/4 x 1/2-inch Sterling Silver St. Michael the Archangel Medal. 13/16" Sterling Silver St. Michael Medal Made in the USA. The Badge Shaped Medal is adorned with a Depiction of St. Michael Slaying Lucifer. 9/16" Sterling Silver St. Michael Medal Made in the USA. The Badge Shaped Medal is adorned with a Depiction of St. Michael Slaying Lucifer. A 18" Rhodium Plated Curb Chain is Included with a Deluxe Velour Gift Box. This 24-inch Sterling Silver Cable Chain features our money-back guarantee and usually ships the same day if ordered before 6PM Eastern Time. Featuring a width of 2.1mm, this Cable Chain weighs 6.83 grams. Paired with one or more religious pendants, this 24-inch-long chain makes an attractive necklace. This Sterling Silver Badge Shaped St. Michael Medal has passed our quality control assessment and meets our strict criteria to be a Catholic Shop product. Buy with confidence.